Exciting news! 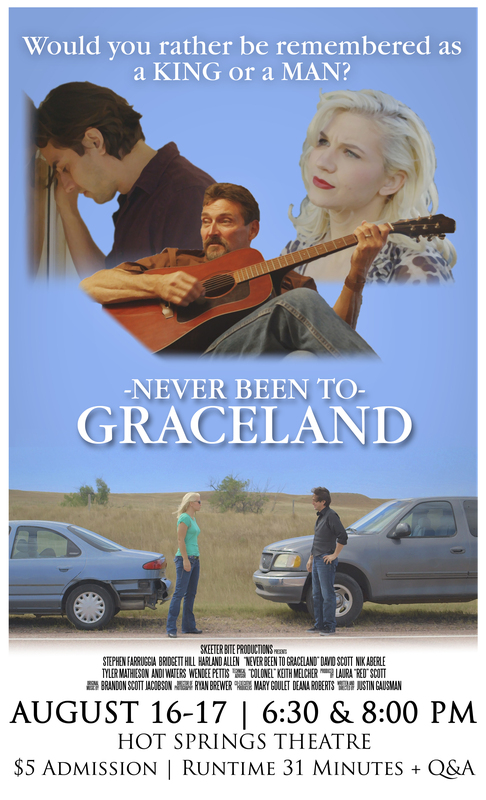 Never Been to Graceland, after 4 years of work, will finally premiere August 16-17 at the Hot Springs Theatre in Hot Springs, SD and August 18-19 at Seraphim Theatrical Entertainment in Rapid City, SD! On August 16, it will also be available on Amazon through Amazon Video Direct, which is arguably even more exciting! It is an understatement to say that after 4 years, I have a lot of mixed feelings about finally unleashing the film onto the world! I will have to write about them soon… Just wanted to get the word out! It’s here! One year of production, four years of development and 16 years of inspiration has led to this! Never Been to Graceland is almost complete! We have officially launched an IndieGoGo to help facilitate pre-orders – check it out here and get your order in! For all of the changes to the story, major and minor, including changing the MacGuffin from a lost Elvis movie to a lost Elvis song, the addition and subsequent subtraction of an array of secondary characters, side plots, and fully fleshed out backstories for nearly all the characters… AJ – who evolved from snarky 17 year old hipster to mid-20s lifestyle journalist – has always been the one to ask if Michael’s been to Graceland and his response has always been the same. The idea of the phrase “never been to Graceland” is to not only set Michael as a character apart from what one would consider an “average” Elvis fan, but also to signal to the audience that their expectations about what they think about the film, the characters and Elvis (both the man and the celebrity) might be challenged. A Christmas Gift – Graceland Preview!